It's a Wednesday evening in the midst of London's rush hour – I'm lucky to come out of Piccadilly Circus station in one piece! 6:30PM hits and I've been invited to the private view opening exhibition of the Miaz Brothers' show at the Lazinc Gallery. 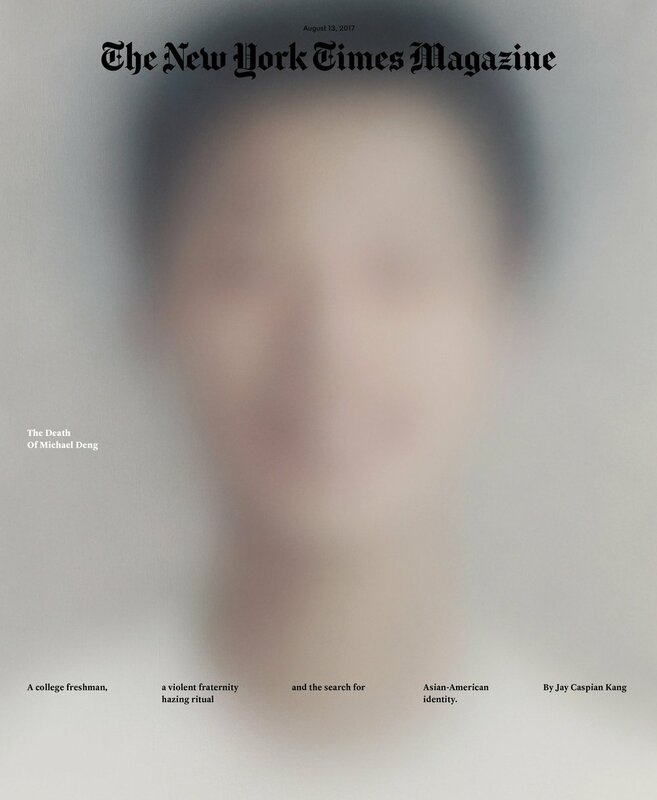 My first encounter with the duo's work was the captivating and powerfully gripping cover of The New York Times magazine, which featured a blurred headshot of a man so obscure that he's unrecognisable without the explanatory line: “The Death of Michael Deng.” Despite the cover being out-of-focus, the visual stood out amongst the endless scrolling through my social media feed. Diving into the print issue, the complex case of the death of college freshman Michael Deng is unravelled in an extensive essay by Jay Caspian Kang, investigating a fraternity hazing ritual known as the Pi Delta Psi. The cover compelled the audience to stop and question everything they knew to be "clear," by purposefully blurring the path to this necessary form of doubt. Painting by Miaz Brothers for the cover of The New York Times Magazine, August 2017. Back to the gathering, I'm greeted by a choice between a glass of champagne and red wine – champagne please! Let's just call it "research" – the choice of drinks reflects the artists' home country of Italy and adopted country of Spain. Lazinc is a spacious gallery, allowing the simultaneous comfort of distance and the desired close-ups to the works! Throw in London's socialite of “who's who” and vibrant music playing quietly in the background – you have an intimate soirée! The opening room features a large portrait of Young Lady 13, 2017, tilted and hung as a landscape; the artwork covers the entire width of one wall – imposing, loud, larger than life. Unfamiliarity with the siblings' work, would make one think the work was blown-up out of focus and left pixelated. Walking up-close to the canvas, I realise the beautiful warm brown and beige hues colours are used to create the illusion of skin tones. 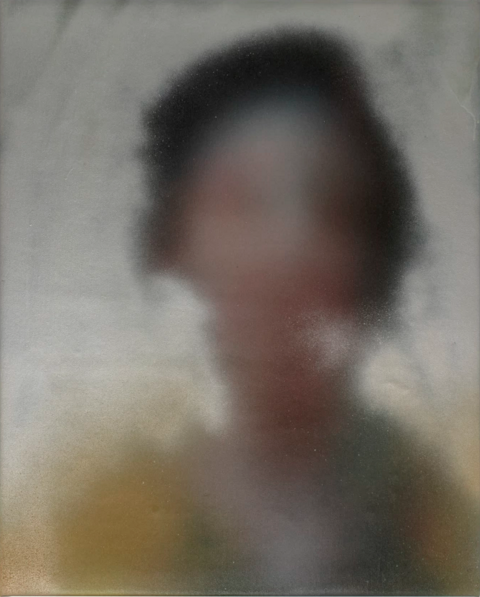 The gripping marks from the spray paint technique are still noticeable on the canvas' surface. The show rightly titled Anonymous cleverly engages with the viewers' sight by pushing the limits of vision past the point where visibility begins to breakdown and we are prompted to develop new ways of seeing what's in front of us. Young Lady 13, 2017 by Miaz Brothers. Gazing around the room, instinctively my attention is pulled to focus on one particular painting – Lady 2, 2017. It's the one painting in the show that I keep reflecting and going back to: staring each time for a few minutes longer as though my mind will suddenly recognise to lady in the painting. With each glance, I long to finally recall the clear vision of the figure behind the blurry painting. Lady 2, 2017 is almost recognisable - she's much lighter in comparison to the surrounding artworks. Beautiful is an understatement but she is breathtakingly elegant and sophisticated with chestnut hair and a softness of being that escapes the canvas. She's obviously beauty-conscious (I continued to wonder): her lips' colour is visible against the pale skin tone. Her shoulders are somehow exposed but she's certainly fashionable with what looks like a pashmina around her arms. I finally come to my own conclusion – she's a historical interpretation, and a combination of Jessica Chastain and Lily Cole. Lady 2, 2017 by Miaz Brothers. Lady 2, 2017, exhibition view at Anonymous, Lazinc gallery. Moving from one room to another, I found myself pacing back and forth in front some of the artworks. Distance plays an important part in the viewer's perspective. 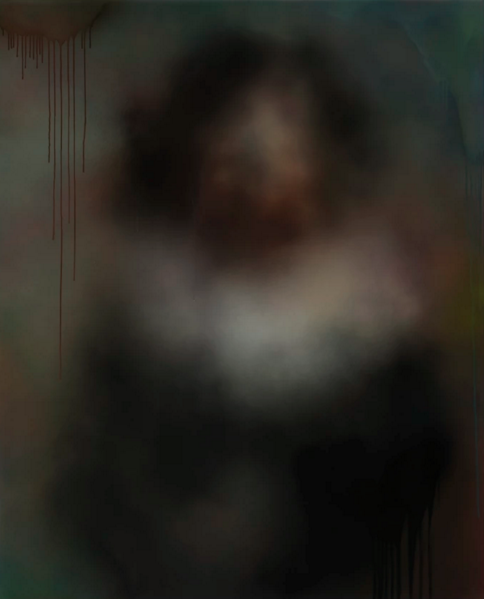 What is clear beyond the blurred lines is a hint at the era and sense of class attached to the artworks – some resemble wealthy Victorian royal figures, queens, mistresses, and politicians, whilst others are slightly vague and almost impossible to place in a social circumstance that would exist outside of the frame. Young Lady 3, 2017 by Miaz Brothers. Old Man 4, 2017 by Miaz Brothers. There's a deep yearning for clarity behind these paintings. Who are these figures, and are they real or fictional? Contrary to The New York Times' search for an Asian-American identity, in which a hunting blurry image is juxtaposed the facts of the danger within the American fraternity culture, the urge for transparency in Anonymous is brought by the digital age of modern times, where we're constantly seeking immediate solutions to all problems. Young Lady 12, 2017 by Miaz Brothers. Young Man 9, 2017 by Miaz Brothers. One could argue that the works of the Miaz Brothers is not far from being an accurate reflection on modern times, where anonymous symbolic online profiles are over-powered by "perfect" selfies. We trust our digital extensions to complete our lives – to build a successfully real persona out of the information we feed it. But not seldom, the digital fails us: we are often left to struggle in our slow, cumbersome material world, while our digital profile identities live on, serving some other purpose. 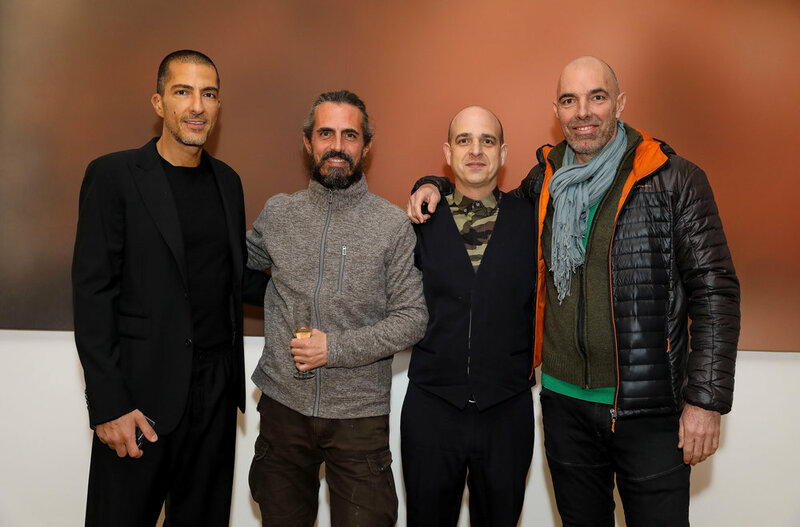 It's no wonder that the Miaz Brothers refuse to give in to this know-it-all crave, and create, instead, a new way of looking at and engaging with identity, leaving the viewers with unsolved puzzles around the scope and strength of anonymity in modern times and the implications of its gradual deterioration. Anonymous by Miaz Brothers runs until 21st April 2018 at Lazinc Gallery, London.